Review posted August 9, 2015. 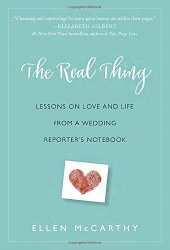 Written by a wedding reporter, this book is composed of stories -- stories of people committing to each other. But Ellen McCarthy didn't stop with weddings and also includes stories of couples whose love has lasted decades. Along the way, she throws in some good advice about finding and keeping the love of your life. Bottom line, even if you don't take any of the advice, this book is fun to read. It doesn't hurt to be reminded that people out there are finding love. The author throws in her own story -- she started as a wedding reporter when she'd just finished a major break-up, but wrote the book as part of a married couple with a child. When I first started on the weddings beat -- also starting, as I've mentioned, a new chapter of single life -- I wasn't sure how it would affect me to spend my days interviewing deliriously happy couples and watching them walk down the aisle. It could have been like salt in a wound. But the job had the opposite effect. All of these people -- young, old, rich, poor, plain, beautiful, sophisticated, and simple -- they'd all found someone. I was reminded again and again that love happens every day, in all kinds of ways, to all kinds of people. And when it does, it adds a beauty and richness to life that nothing else can match. So a couple of months after the breakup, I found my dating legs again. This time I had the lessons of the people I'd written about swirling around in my head. Their experiences pushed me to be more open and optimistic, and at least try to enjoy it. Even more important, the collective wisdom of these couples challenged me to rethink what I was looking for. So much of what they taught me about love ran contrary to what we learn in pop culture and society. Don't look for lightning. Forget about presenting your best self -- it's your real self that counts. And dreams do come true, but almost never how you dreamed them. Yes, reading these stories could have been like pouring salt in my wounds. But it wasn't. Instead, this book left me smiling and encouraged.